For the second straight year, there will be a gauntlet match on WWE television on the go-home week for Elimination Chamber. 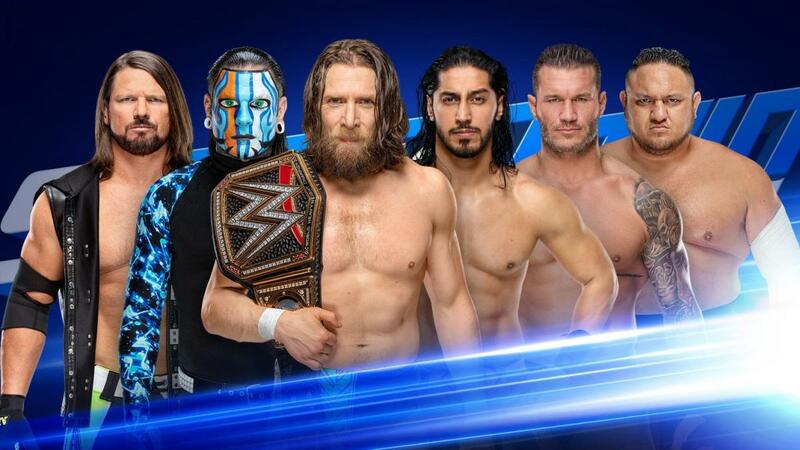 WWE has announced that WWE Champion Daniel Bryan, AJ Styles, Randy Orton, Mustafa Ali, Samoa Joe, and Jeff Hardy will face off in a gauntlet match on Tuesday's episode of SmackDown. Those are the six wrestlers who will be in next Sunday's Elimination Chamber match for the WWE title. The winner of the gauntlet match will enter the Elimination Chamber last during their match at the pay-per-view. There was also a gauntlet match with Seth Rollins, Roman Reigns, John Cena, Elias, Finn Balor, The Miz, and Braun Strowman on Raw's go-home show for Elimination Chamber last year. Strowman won it, and Rollins defeated Reigns and Cena and was in the gauntlet for more than an hour. The Usos will appear on "McMiz TV" with Shane McMahon and The Miz on Tuesday's SmackDown, which is taking place at the Huntington Center in Toledo, Ohio. Shane & Miz defending their SmackDown Tag Team titles against The Usos has been announced for Elimination Chamber.